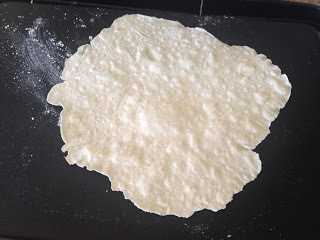 Homemade Tortillas. Who knew you could make them at home and taste delicious?? Have you looked at the ingredients on the tortillas you buy at the store? There is a huge list of crap on them. Usually hydrogenated oil is listed (tricky way of saying there’s trans fat). If you find a decent tortilla, they’re pretty expensive. No more!! Ever since I stepped into the fitness and nutrition world, I have been on a journey to find better quality foods. Not just foods that have “better” or lower calories on the package, but foods that have “real” and quality ingredients. Honestly, my view of “healthy” has transformed a little in the last few years. It’s not low-fat or no fat that makes something healthy, it’s going back to the source….to the ground or the animal. Finding foods that aren’t processed inside a chemistry lab and factory plant. Put first 3 ingredients in bowl and mix together. Cut in butter. 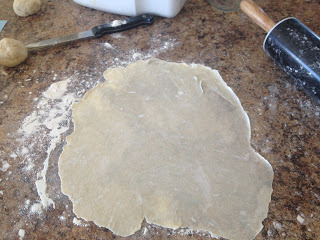 I usually cut it in chunks and then use fingers or pastry fork. Sorry I didn’t get pictures of this part cause I didn’t think about it till the next couple steps. Pour in hot water and form into a ball. 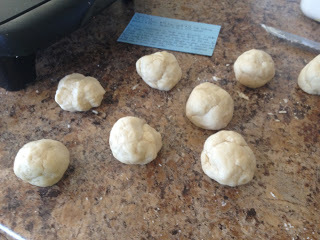 Kneed dough a few times (less than a minute). Form into balls. I did 10 larger tortillas, so 10 balls. 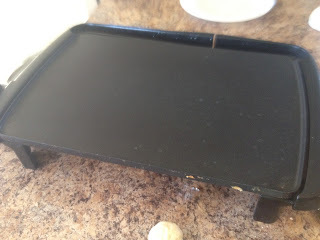 I like using a griddle that plugs in so it regulates the temperature constantly and doesn’t get too hot. Or you can use a skillet with no spray. 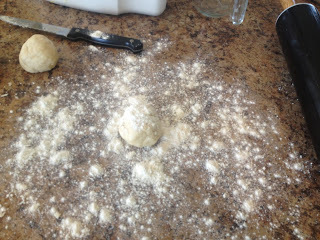 Flour surface and put ball on it. Sprinkle with a little flour. 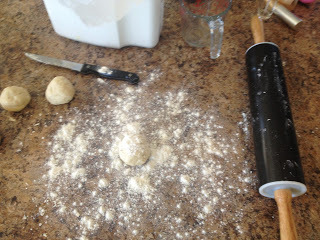 Use Rolling pin and roll very thin. Put on hot skillet for 30 seconds or so. Let it bubble a little. I don’t let it brown very much. Flip and let it cook another 30 seconds or so. BAM. That’s it. Use the tortillas for whatever you wish. They do taste great. I got large plastic bags to put them in. If you leave them out then they’ll get crispy and crack when you go to use them. 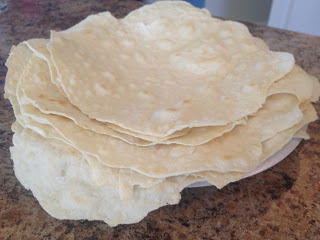 Homemade tortillas are not only less processed, they’re more cost effective. 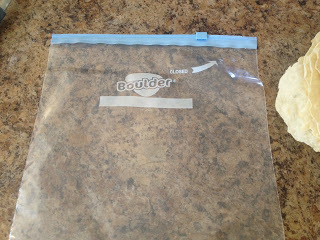 These cost about 75 cents to make….not too shabby when you will pay more than twice that for ones at the store. And 10 large tortillas adds up to about 6 grams a fat per tortilla…not horrible, especially because there’s only 5 ingredients. I hope you try it out and stop buying store bought tortillas! If you would like less mess it’s totally possible. 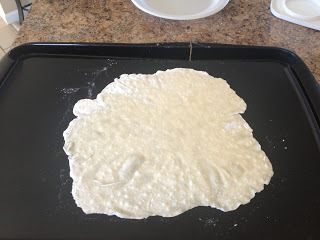 I didn’t like how (flour-ie) my hands would get while eating the tortillas. So now I don’t dust with flour and the tortillas don’t stick when I roll them. Win win. Plus the pan doesn’t smoke because of dry flour being on it. Also, I had issues with the tortillas getting a little hard. So I put a towel over the plate of freshly made tortillas, lift it up to put a new one on. It keeps them moist so they stay soft. 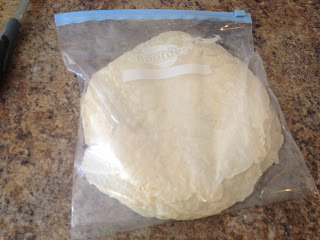 Them I out them in a large Baggie or cover the plate tightly in plastic Wrap. So now they are less messy and more soft like ones you buy at the store…but taste way better!